Once upon a time, a maiden came from the heavens to bathe in a stream. Her robe, which enabled her to return to her home, was stolen by a young man who forced her to marry him, beginning a long line of half-human, half-celestials. But just as her blood flowed through the veins of mortals, so did the maiden, Ceres, plot her revenge. To teenage Mikage Aya, something like this would sound like a grim fairy tale, and nothing could be further from her mind as she hangs out with her friends and her twin brother Aki on her 16th birthday. But her family's deep secret is about to emerge, and in a moment, everything Aya knows is shattered for the lie it is. Watase Yuu's manga successor to Fushigi Yuugi is now a full-season anime series. How does it live up to its predecessor? Well, for starters, it has one of the coolest opening song gimmicks of all time. The characters are sitting at a karaoke bar, when they tell the heroine it's her turn to start singing. ^_^ Naturally, it's also a beautiful song - Iwao Junko's haunting performance of "Scarlet" is easily one of the best ballads featured in any anime. For those of you unfamiliar with the manga, a pair of twins has been together since birth (duh~), the sheltering, overprotective (but funny) brother, Aki, and his cute, kinda outgoing (but not) sister Aya. They think they're just normal students. The introduction of the characters as teasingly affectionate and refreshingly normal basically contrasts with the rather brutal fate that's in store for them, since Aya and Aki's birthday proves to be more than just the normal trip to Grandpa's house, as their lives as teenagers are suddenly and irrevocably destroyed. You see, Aya harbors a celestial being known as a tennyo, who may seem like a Western angel, but is nowhere near as benign. 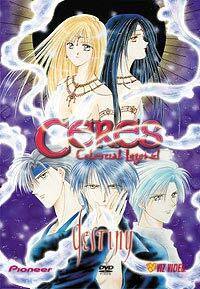 The spirit, named Ceres, is the Mikage family's hereditary secret, and it is for this secret that Aya must pay ... with her life. Luckily for Aya, there are people who are willing to protect her, and it is with these people (including the mysterious pretty-boy Touya and the loyal Yuuhi) who we end up spending most of our screen time. As you get to know the characters, you'll inevitably get ripped up by what they go through - a hallmark of a good Watase Yuu series. The animation isn't particularly eye-popping, though it doesn't seem to have quite the animation pitfalls Fushigi Yuugi did (not that that's saying much). No real action, except for a slow-motion scene or two - much of the "animation" relies on still shots and dramatic pan. This is obviously very shoujo in that respect, too. Let it be said that, though, this is no ordinary shoujo drama, as from the get-go, there is some rather brutal and bloody violence, and the intensity level stays fairly high throughout the series. With the rerelease of this series in an affordable Collector's Edition box set, viewers no longer have to worry about having to shell out hundreds of dollars to finish the story as the creators intended. Recommended Audience: Not for young children. This series gets violent quickly, and it's pretty evident that there's going to be some sexual tension throughout this series as well.